The Smacksy February Happy Good Things Thing - Day 28 - . 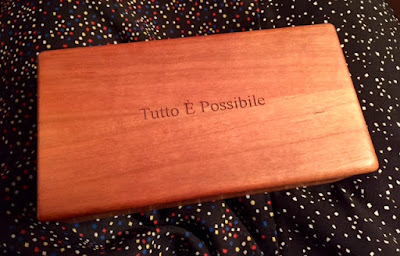 On the top, write the Italian words "Tutto É Possible." (Translated in English, this means, "Everything is Possible." On a small piece of paper, write down a worry that has been bothering you. Fold the paper in half and place it in the box. Leave that worry to other forces and move on to this moment. When you catch yourself ruminating on it again, remember that you've put it in the box and move on. If you'd like more insight into this idea, you can read about it here. Thanks for a lovely February, friends.